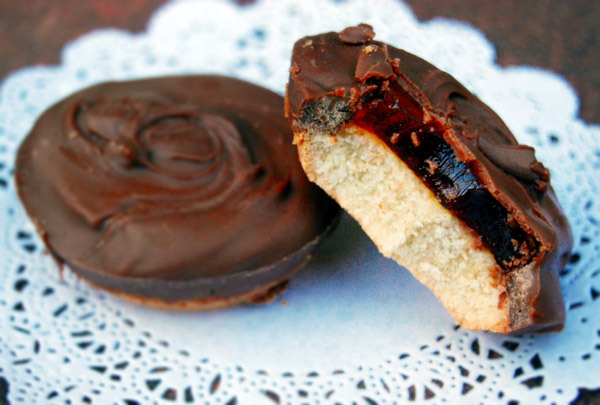 Jaffa cakes… those delightful little treats that I should never have discovered. It was an unusual looking, seemingly harmless cookie type confection sitting in its box on the aisle with all the other inexpensive “biscuits”. We picked up a box, to give it a try. We do feel that it is our duty to try as many unusual British treats while we are here. Part of the cultural learning experience, right? These Jaffa Cakes look like little Nilla Waffers. Nilla Waffers, you know, the boxed cookie that in the deep south owes its fame to “nanner puddin’ “. I took one of these cakes…er biscuit…cookie things and looked it over. No big deal…it looks like a Nilla Waffer with chocolate on one side. I sent a few in Rob’s lunch. A little after 12 that day I get a text from him. “Those Jaffa Cakes are AMAZING.” I got one from the kitchen and popped it in my mouth and WOW! Nothing like a Nilla Waffer. More like a cake. That it seems is the debate. Jaffa Cake, cake or biscuit? I find that there is in fact a debate raging in Britain about these delightful little snack confections. “Ha!”, I thought, “Are there not enough problems in the world that we must debate whether these are cakes or biscuits?” Well, it seems there is a bit more at stake in this debate, more than just name alone. As I understand it “cakes’ are considered daily baked goods and perishable in a day or two. Therefore “cakes” are not subject to the taxes that less perishable boxed “biscuits” or “cookies” are subject to. So……. 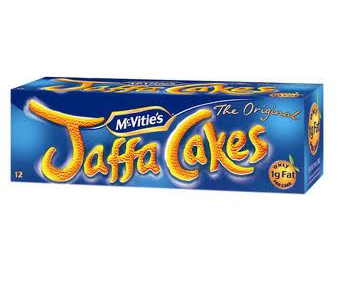 if Jaffa Cakes are indeed “cakes” they can slip under the tax radar. If they are a “biscuit or cookie” then they must pay up. The debate rages on. Me? I don’t really care so long as the box in my kitchen cabinet keeps dealing a few of these delights into my hand each day.